Princess Diana and Prince Charles at Patterson Station. Photo dated May 6, 1986. Click for a much larger version! 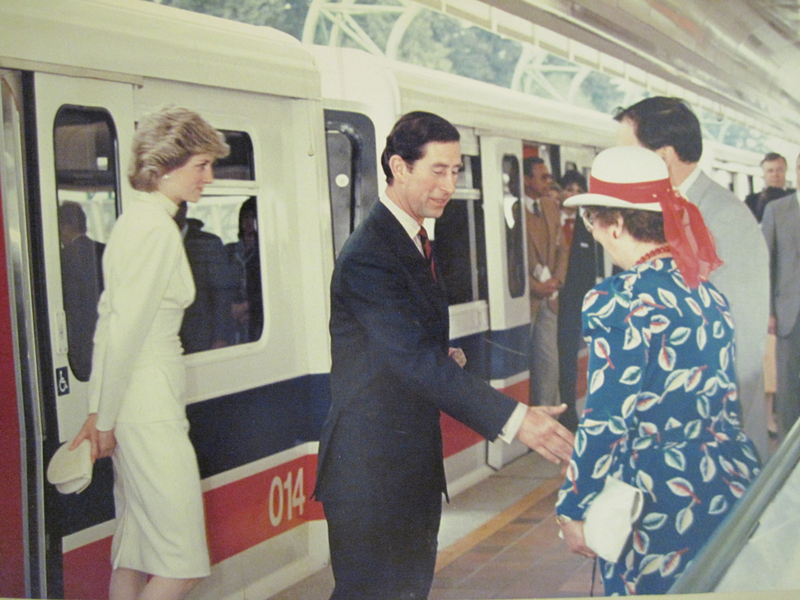 Prince Charles and Princess Diana with SkyTrain car 014. Click for a much larger version! 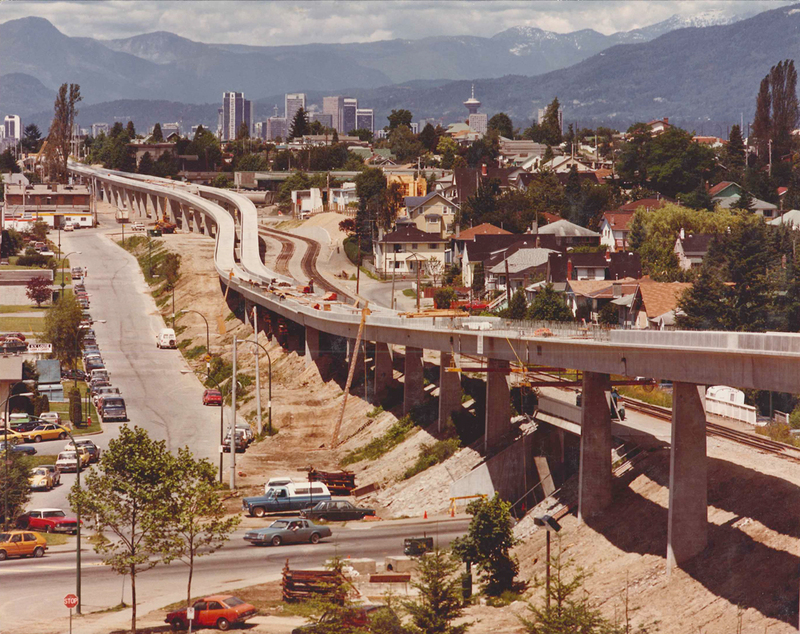 Again, as it’s SkyTrain’s 25th anniversary this year, I’ve assembled some historic photo treats to share with you today! 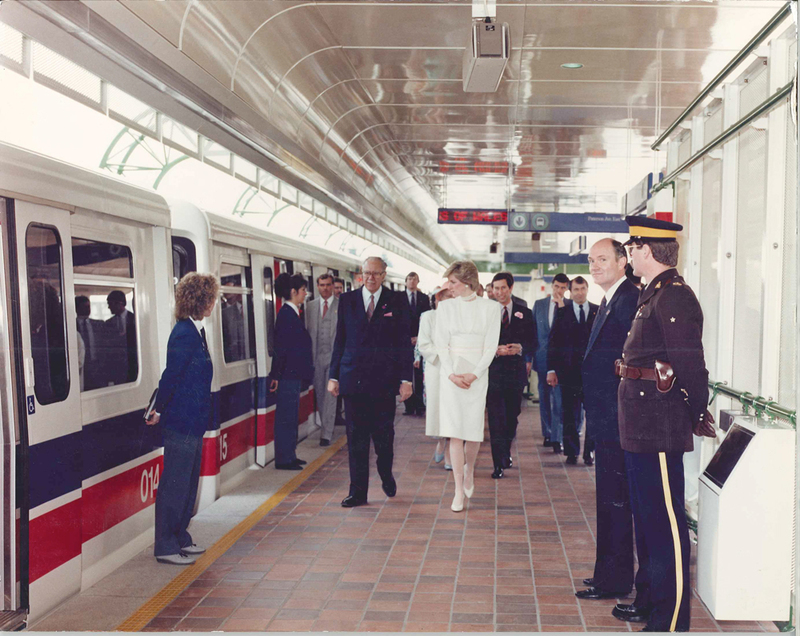 I found the photo above in the TransLink offices: Diana is walking at Patterson Station, with Prince Charles just behind her. The one at right was from the Buzzer’s Jan 20, 2006 issue, and the one below was sent in by Jennifer Siddon at SkyTrain. Also, Global Edmonton has this photo of Charles and Diana apparently heading to Waterfront Station (or does that look like a different station to you?). Notice that car 014 is the one Diana and Charles rode in! I’m not certain there is a plaque inside it for them, but car 014 does have one for the prince and princess of Belgium, and the princess of Thailand. I’m not sure why car 014 got to be the bearer of such prestigious guests, but next time you ride it, know that you’ve shared the same space as countless royals! Prince Charles and Princess Diana at Patterson Station. Click for a much larger version! I’ve collected the remaining photos from around the TransLink and SkyTrain offices: I don’t think they’ve been widely seen before, so hopefully this is all new to you! 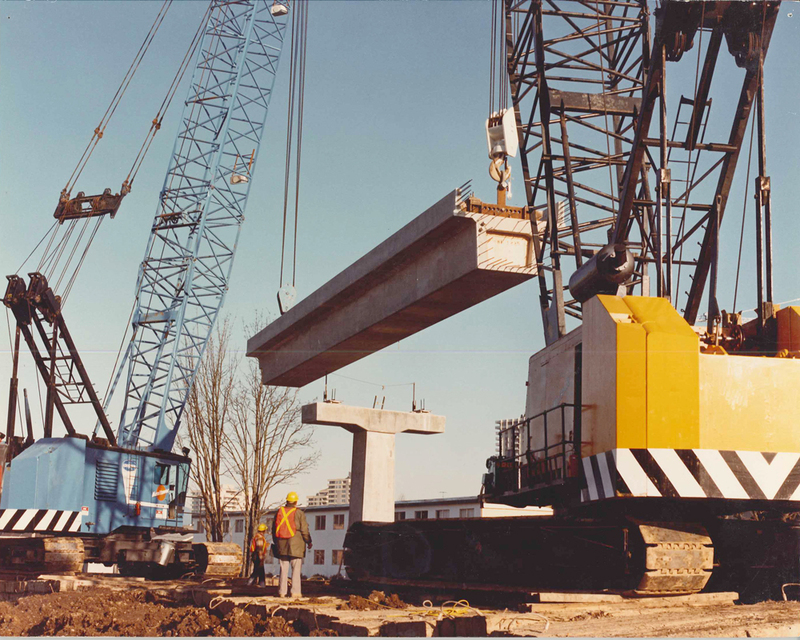 A beam being put into place on the guideway. Photo dated March 1984. Click for a much larger version! Clearly this is a beam being put into place: can anyone identify where this photo was taken though? I’m not certain the surroundings are descriptive enough to help us figure it out! Guideway construction northwest of the Telus building. Photo dated July 1984. Click for a much larger version! 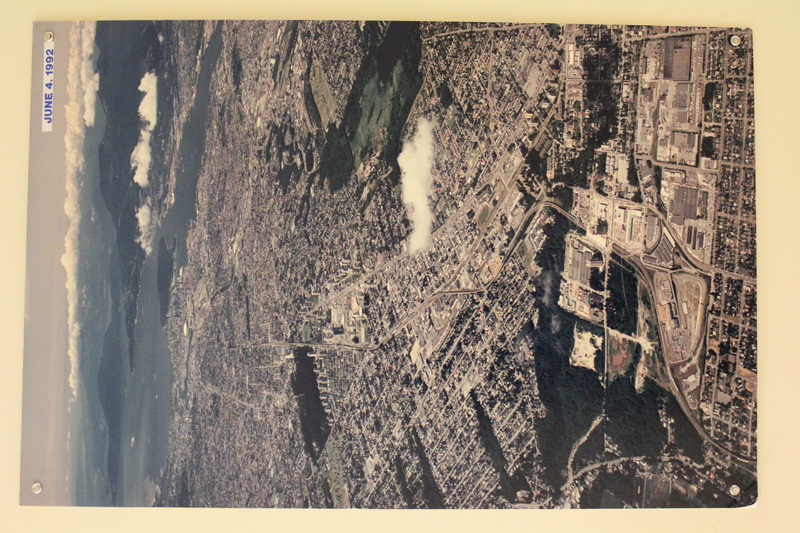 There’s no location given for this photo either, but I consulted my colleague who is exceptional at figuring out geography, and he said, “I believe this is facing north-westwards from the Telus Building (used to be the BC Tel building). It’s at Vanness (the small street running parallel to the SkyTrain) and Boundary (the street running underneath the SkyTrain).” This sounds good to me: but if you have a differing view, please do share! 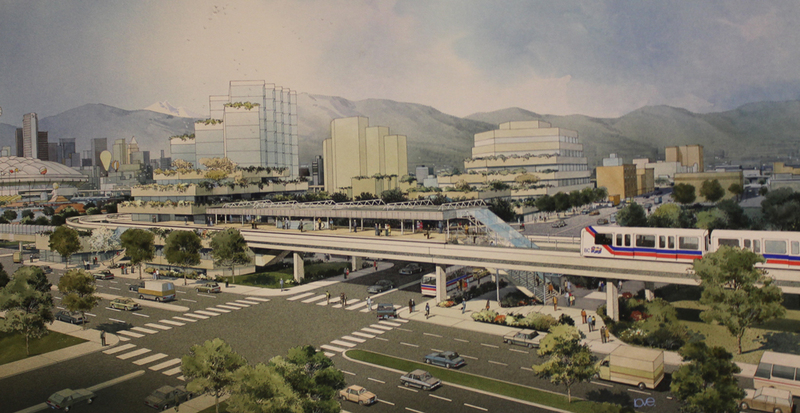 Conceptual drawing of Broadway Station. Click for a larger version. 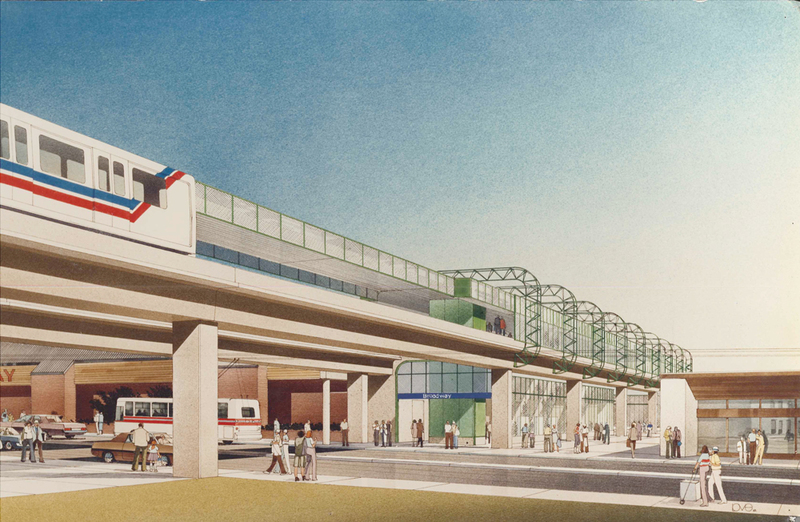 Here’s a conceptual drawing of Broadway Station (now Commercial-Broadway Station). It’s funny how little the station area has actually changed from this drawing! Conceptual drawing of Main Street Station. Click for a much larger version. And here’s Main Street Station envisioned in pen and ink. 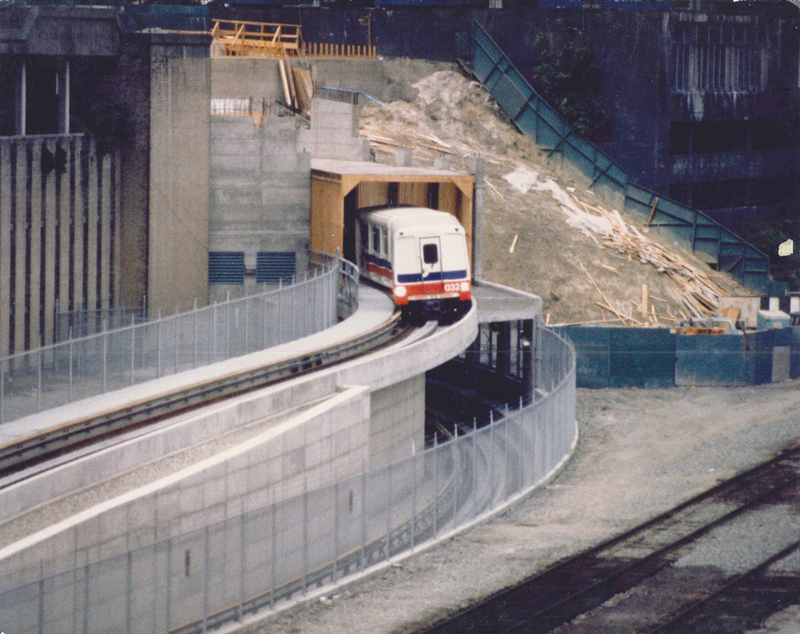 A SkyTrain car coming out of the Dunsmuir Tunnel downtown. Click for a much larger version! A car coming out of the Dunsmuir Tunnel entrance around Waterfront Station. No date on this one, but it’s definitely early 80s! The SkyTrain running near Stadium Station. Photo dated August 1986. Click for a much larger version. If you want the exact location, the back of this photo says “West of switch 12, Stadium Station.” Note the monorail station at lower right, and the popular Expo cement sculpture featuring cars and other transportation! 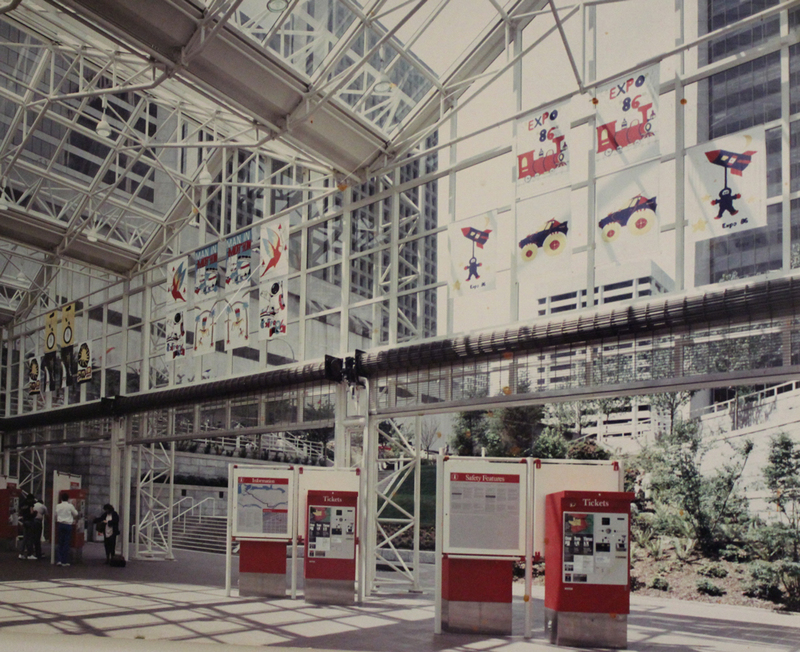 Burrard Station dressed up for Expo 86. Click for a much larger version! 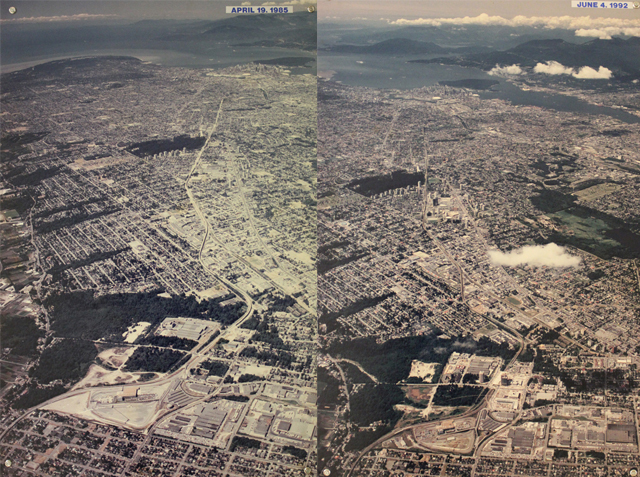 The SkyTrain route photographed in April 1985 and June 1992. 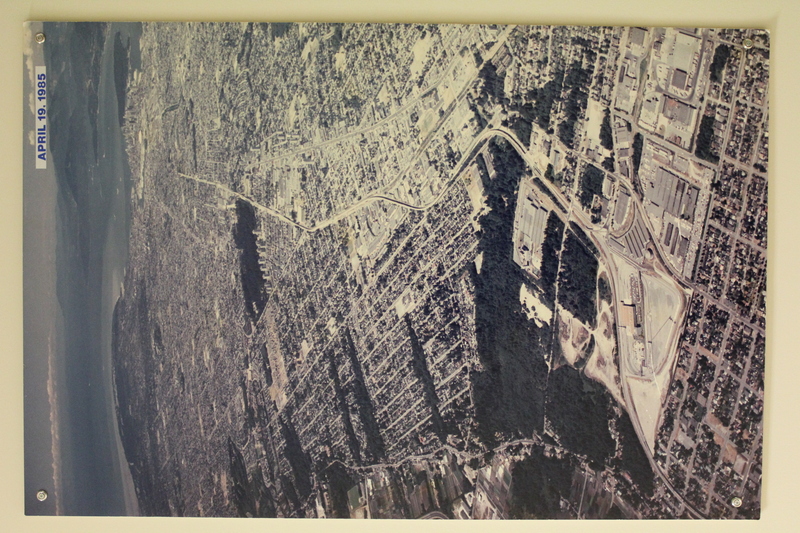 This set of photos is mounted on the walls of the SkyTrain operations and maintenance centre: it shows the SkyTrain route in 1985 and a comparison shot taken in 1992. You can see little towers popping up all along the route! For larger versions of each photo, click here: April 1985, and June 1992. Metrotown Station in the 1980s. Click for a larger version! 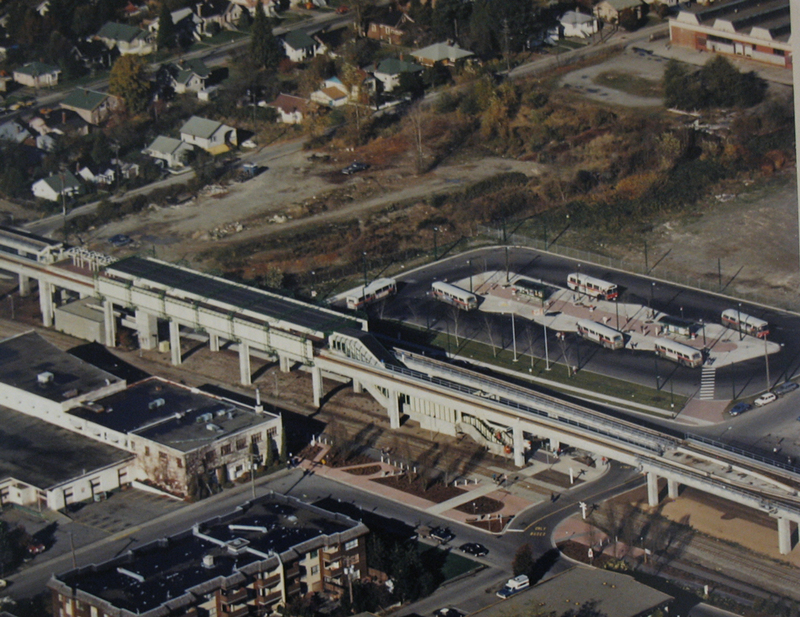 And here’s that classic photo of Metrotown Station back at the dawn of SkyTrain. No mall, just a bus exchange! 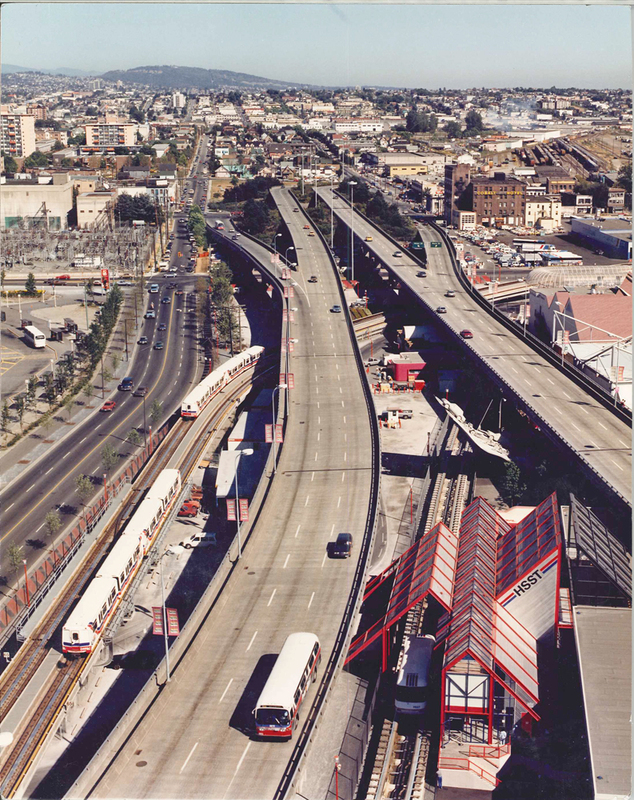 Remember, you can check out the entire Transit History category for more photos, videos, and stories on SkyTrain’s history and more. Happy 25th, SkyTrain!